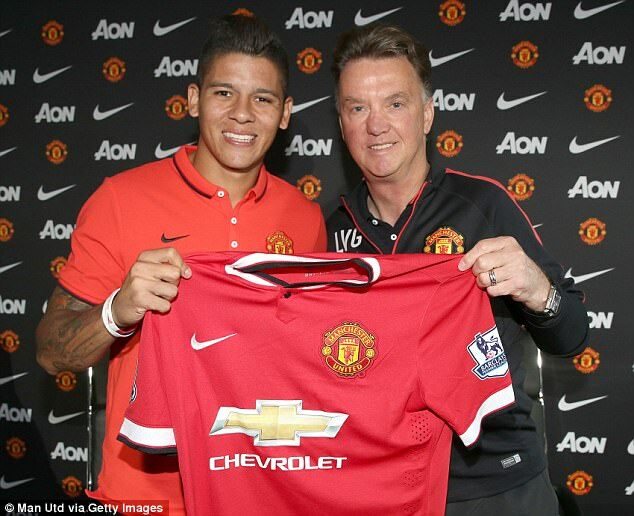 The UK border agency agrees to grant defender Rojo a visa and will be available to face QPR on the 14th of September. He has not been available to play because of a pending work permit. He qualifies automatically by virtue of having played 75% of Argentina’s competitive internationals over the last two years. I am desperate to get onto the field and play because I have not been able to step onto Old Trafford…This is a very important step in my career as a player and as a person. Everything that has happened to me since the World Cup has been a dream. Ronaldo plans to return to Manchester United in the future. The current holder of Ballon DO’r is still tied to a long term contract with Madrid and has every intention to honour the contract. Everyone knows that – I have said it many times. Manchester is in my heart. I left many good friends there, the supporters are amazing and I wish I can come back one day. 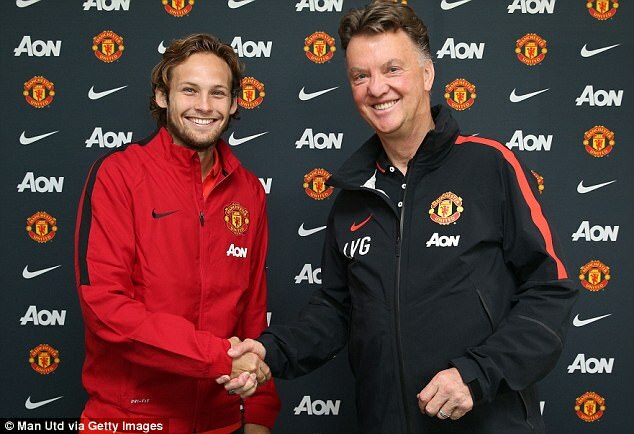 Blind signs from Ajax to Manchester for £13.8 million. 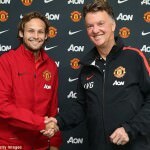 The Dutch international agrees a four-year deal and will play at left back as a defensive midfielder. 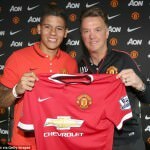 It is a real honour to sign for Manchester United. I have been at Ajax since I was seven years old and I will always have very fond memories of the club and of my time there. Man U make a trip to Turf Moor to play newly promoted Burnley and all eyes are on Di Maria who has arrived from Real Madrid and will make his debut today. Man U have 1 point from their past first two games. Man U last visited Burnley in August 2009. Kick off time is 12:45 pm GMT and the referee is Cris Foy. Van Gaal. United can win the title but fans have to be patient. United stay winless against Burnley. The awaited for debutant Angel Di Maria features for the side but does not score.. It is United’s former star David Jones that almost gives Burnley the lead when the midfielder curls a free kick against a cross bar. Goalkeeper Tom Heaton keeps the score level when he produces a fine reaction to a well struck shot by Van Parsie. Di Maria is substituted 20 minutes to the end after kicking his calf and Wayney Rooney heads the ball wide at the far post from a corner. United are denied a penalty towards the end of the game when Ashley Young’s shot hits the arm of Ashley Barnes. It’s a matter of making errors at the wrong moments. When you see the goals against us, I believe it was big errors in building up situations that you cannot make these errors. Four at once, then it’s 0-2, then it’s very difficult to come back in the game. Di Maria signs for Manchester United from Madrid for 59.7 million pounds. The club is set to announce his transfer officially on Tuesday (28 August) morning. The rapid nature of his deal means that his registration can be completed by the Friday lunch time break and this will make him available for Saturday’s trip to Turf Moor to play against Burnley. It was a good game to watch. We played a very good first half, going forward taking chances and creating half opportunities after conceding at what was the wrong time really because we were in control of the game. It was a big effort. Marcos Rojo signs for United from Lisbon for £16 million and a swap for Louis Nani to move back to his former club on a year-long loan deal. The twenty four years old Argentine star plays in the position of a defender and 5 is his squad number. Swansea scores their first goal at Old Trafford through Ki Sung-yeung. This prompts Louis Van Gaal to make quick substitutions and change the game format from the original 3-5-2 to 4-4-1-1 which rewarded the team with a goal through Rooney but they couldn’t hold onto the draw for long as Swansea scored another to emerge winners of this game. We didn’t reach our level, what we have shown in the past, and that is disappointing. That’s why we lost today. We need defenders, but I have already said that. We never played as a team today, and that was our error. The preseason friendly between Manchester United and Real Madrid brings 109,318 spectators to Michigan Stadium, which is an attendance record for a soccer game played in the United States. Man United won with a 3-1 score. Ashley Young scored the first goal for the Red Devils. After Gareth Bale scored a penalty kick to equalize, Young scored again and Javier Hernandez scored the fourth goal of the game. The England international signs from Southampton for £27 million pounds ,his squad number is 3 and plays the position of a defender. 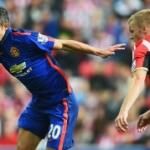 Shaw signs a £100,000 pounds a week, five-year contract. United make it back to back League Cup triumphs with a 2-1 victory over Aston Villa at the new Wembley. 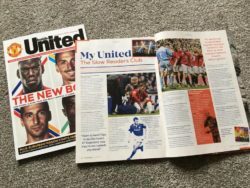 88,596 see goals from Owen and Rooney secure the trophy for the Red Devils, their fourth League Cup win, and their third in five years. United lift the 2009 League Cup after a penalty shootout victory over Spurs after a disappointing goalless game. 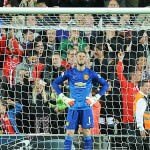 United score all four of their penalties while Spurs miss two of their three and miss out on winning back to back League Cup finals. League Cup FinalsWigan Athletic F.C. Wigan Athletic’s fairytale run to their first major final turns into a nightmare as goals from Saha and Ronaldo plus a brace from Rooney give the Red Devils a comfortable victory. 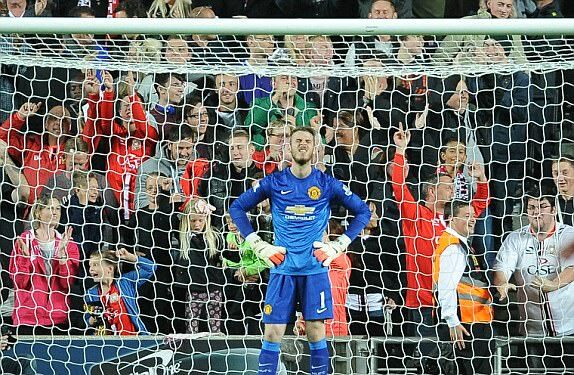 A crowd of just 66,866 see the Red Devils lift the League Cup for the second time. 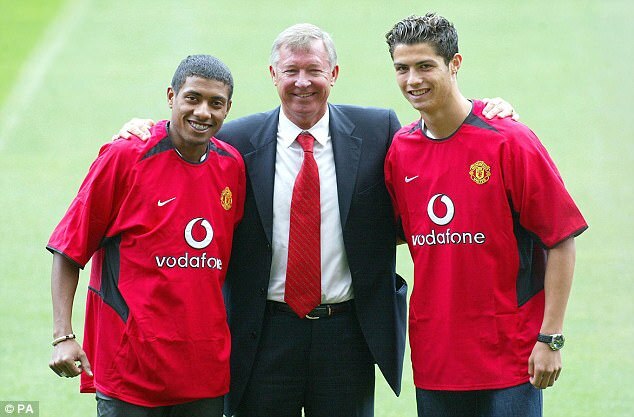 Ferguson signs the 18-year-old player in the 2003 pre-season for £12.24million. Ferguson also gives the player the number 7, previously worn by Eric Cantona and David Beckham. Goals from Steven Gerrard and Michael Owen give Liverpool victory against their fierce Lancashire rivals at the Millennium Stadium. 74,500 fans see the Merseysiders secure a record seventh League Cup win … their second in three years. 77,231 fans see Aston Villa win their fourth League Cup Final at Wembley Stadium. Two goals from Dean Saunders ensure that the Villains stop United from winning the domestic treble. Manchester United lift the trophy for the first time before a crowd of 76,810 at Wembley Stadium. Brian Mclair notches the only goal of the game – the first medal of Ryan Giggs’ career. In the first League Cup final sponsored by Rumbelows, Sheffield Wednesday upset Manchester United in front of 77,612 fans at Wembley. John Sheridan’s goal gives Wednesday a double of the League Cup and promotion back to the top flight. The Club is sold for £20m in the biggest takeover deal in the history of British football. The new owner is Isle of Man-based property tycoon and former footballer, Michael Knighton. Manchester United chairman Martin Edwards is to receive more than £10m for his majority share in the club and will stay on as chief executive. There had been rumours for some time that Mr Edwards was planning to sell his stake but the deal was shrouded in secrecy. Liverpool win their third consecutive League Cup – again coming from behind as Kennedy equalises Norman Whiteside’s opener for United. The hero for the Merseysiders is once again Ronnie Whelan, who scores the winner in extra time in front of 99,304 spectators at Wembley. 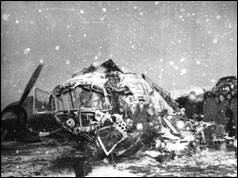 Seven Manchester United footballers are among 21 dead after an air crash in Munich. 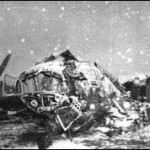 The British European Airways (BEA) plane caught fire shortly after take off this afternoon with 38 passengers and six crew on board.